Obviously there's the Night King and his new wight-dragon, and here are the others. The main focus of Season 7’s penultimate episode – “Beyond the Wall” was the mission to capture a wight to convince Cersei, and everyone else, that the army of the Undead exists and is a real threat. There was so much happening in the episode - the battle, the dragon, the Starks, and all that. When there's a battle, there are winners and losers. Here are the winners of "Beyond the Wall." The Night King didn’t do anything during the battle because he didn’t have to. He had thousands and thousands of wights to fight for him. Sure he lost one White Walker that was killed by Jon, but he didn’t break a sweat while Jon and the rest of the ‘Suicide Squad’ were fighting for their lives. The moment the Night King did do something, he killed one of Daenerys’ dragons with just a single spear. Viserion fell and sank into the lake – the scene (which was followed by a close-up shot of Daenerys) was magnificently horrifying and heartbreaking. Like the Massacre at Hardhome, it showed how terrifyingly powerful the Night King is. In the final sequence of the episode, the Night King had the wights pull Viserion out of the icy lake. With a single touch, he turned Viserion into a wight-dragon with glowing blue eyes. 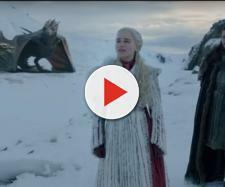 Fans are already wondering how Daenerys will feel when she sees zombie-Viserion and how much chaos he will bring under the Night King’s commands. Jon Snow might just be the luckiest person in all of Westeros. After another near-death experience beyond the Wall, he survived yet again. He fell into the icy lake and made it out only to see more wights coming his way. He was saved by Coldhands (aka. Uncle Benjen) just in time. Uncle Benjen had his horse carry Jon back to Eastwatch while he sacrificed himself to fend off the wights – which led to his death. Not only did Jon survive the battle, he discovered that when a White Walker is killed, the wights he controls also die. Jon and the others even discussed this while they were on the island. All they had to do was kill the Night King – but it’s not that easy, especially now that he has a dragon. Finally, Jon convinced Daenerys about the threat of the Undead. Jon apologized for the death of Viserion and said that they should not have gone beyond the Wall. She disagreed, because “you have to see to know” and now she knows. She gave her word that they will destroy the Night King and his army, together. Petyr Baelish’s plans are set into motion and are going really well. The two Stark sisters are turning against each other. Arya doesn’t trust Sansa and she has the letter, which could threaten Sansa’s rule at Winterfell. Sansa is creeped out by her sister after discovering the faces under her bed, which makes her realize how much she doesn’t know her sister. Sansa turned to Baelish when Arya threatened her, just as he planned. Bran probably knows whats-up, but he’s also probably too consumed by all the visions in his mind – being the Three-eyed Raven and all. Though Queen Cersei (and the rest of King’s Landing) were not shown in the episode, she still had small victories throughout the episode. For one thing, the two Stark sisters are busy fighting each other and with the death of Viserion, that’s one less dragon to worry about. The King in the North almost died and Daenerys is also off, putting her life in danger. She is also continuously in disagreement with Tyrion. Cersei is probably having a good time at King’s Landing.